Was held on February 5, 2019 a Press Conference regarding the AmCham - Bain Barometer 19th Edition on "Satisfaction of American Investors in FRANCE". AmCham is a French Think-Tank based in Paris, which has been bringing American and French Experts together for over 120 Years. Today, It is a Platform for Reflection on the Transatlantic Relationship, constructing Disruptive Ideas and Policy Solutions to contribute to the Democratic Debate. Working directly with a Variety of Economic Sectors, AmCham France counts 350 American and French Companies as Members. Among these are CAC40 and Fortune 500 companies, as well as Numerous Startups and SMEs. Rooted in the Shared ideals of the French and American Revolutions, the French-American Relationship has evolved greatly from the Bonds established more than Two Centuries ago. From the Battle of Yorktown to the Invasion of Normandy, the French-American Alliance has grown Stronger and Stronger throughout the Years. For more than Two Centuries, Big Thinkers on Both Sides of the Atlantic have highlighted Differences between Americans and Europeans. After 1945, however, the Soviet threat drew them both together into one Transatlantic "West," a Relationship given Institutional Expression in NATO. France and the United States, in addition to their Strong Relationship at the Political Level, have deep Economic Ties that are Mutually Beneficial. These Trade and Investment Flows support Growth, Jobs and Innovation in Both Countries. Some Three Million Americans visit France each year. The United States and France share Deep Trade and Economic Relations. Each Country is among the Other's Largest Trading Partners. Different Locations around the Globe have Cultural Differences ; however, many Individuals do not know that Businesses located around the Globe also have Differences with Relation to Business Culture. And because so many Businesses today span the Globe, understanding Specific Business Cultures that are Common in other Countries is Imperative for those who hope to succeed in this New Worldwide Business Marketplace. The Country ranked 31st out of 190 Countries in the 2018 Doing Business Report published by the World Bank. The Country's Strengths include its Position as Europe's Third Power, its Highly-Skilled Workforce, its Large Industrial Base, its Agricultural Resources, its Worldwide Cultural Reputation and its Geographic Location at the Center of Europe. France is one of the Top Ten World Economic Powers and has many Assets to attract Foreign Investors. ** A Diversified Economy that is full of a Wide Range of Players ranging from Large Multinationals to High-Tech Start-Ups (French Tech). 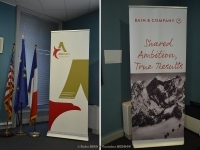 -- AmCham - Bain Barometer 19th Edition "Satisfaction of American Investors in France"
** It aims to measure from Year to Year the Morale of American Investors in France and their Perception of the Economic Environment (Launched in 1995). To collect the Opinions of American Investors on Current Economic Topics in France. To understand American Employees Drivers and Detractors of living in France. ** From December 2018 to Mid-January 2019, a Questionnaire was sent to the Management of Subsidiaries of American Companies in France (127 Answers from US Companies covering more than 52,000 Employees and more than 52 Billion Euros Turnover). ** Respondents are also concerned by French-American Relations and a Potential Trade War between the European Union and the U.S.
Amcham - Bain Barometer 19th Edition "Satisfaction of American Investors in France"